Dates & Hours: No More! 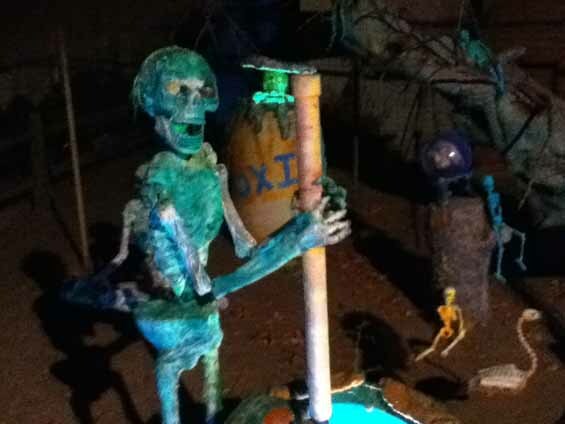 Sadly, a fire destroyed the props and costumes for this home haunt, which formed the epicenter in a Los Angeles neighborhood overflowing with Halloween spirit. Many other houses were decorated, and the sidewalks overflowed with trick-or-treaters. The yard haunt itself was loaded with mannequins of all shapes and sizes, many of them mechanical. As if that were not horror enough, a handful of monsters lurked around the sidewalk on Halloween Night, inflicting fear on unwary travelers. Although there was no walk-through maze,trick or treaters did have to maneuver along a walkway between some fences to get to the front door for candy; the escape route took them past a upright coffin that - surprise! - turned out to be occupied. The Hart Street neighborhood clearly loved Halloween. It's sad that their signature haunt is no more.